Popular CAMS Australian Rally Championship driver Peter Dunn is excited to make his return to the ARC after confirming his entry for this month’s Kennards Hire Rally Australia. It’s been 12 months since Dunn last competed at a national level, his last event being the same round last year, where he finished the season finale in sixth. With his much-anticipated return to the ARC postponed twice this year, Dunn is now eager to get back into the car alongside co-driver Mark Dunn. “I am very excited to get back out there,” Dunn said. “It’s a great event and we know the roads quite well so we are looking forward to it. Dunn will campaign a four-wheel drive Subaru BRZ in 2019. 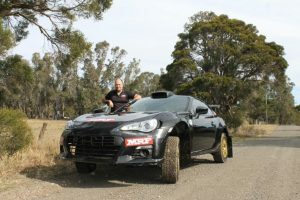 The pair was hoping to also compete in the World Rally Championship at Coffs but were unable to get their STi up to the international requirements needed to enter. While Dunn was hopeful to compete, he was also aware that the logical avenue would be to be patient and compete at the ARC which is a championship he still enjoys. “At the moment I am quite happy to be competing at ARC because we have our new BRZ coming soon, so we didn’t see a point of bringing up the STi,” Dunn added. “The new fuel tank for the BRZ didn’t fit the Subaru so we didn’t want to spend more money on it when we’re bringing in a car the which does have the required specifications. Despite the pair only competing at club rallysprints and khanacrosses at a local level, Dunn is still confident that they can secure a strong result in their first major event for 2018. “We were running around top five for most of ARC last year, so our aim is to finish in the top five of ARC this year,” Dunn explained. “Our Subaru might be the lightest on the field but it’s one of the toughest and in an endurance event like the WRC, it goes quite well. The Kennards Hire Rally Australia takes place on the Coffs Coast on 14-16 November and will be the final round of both the CAMS Australian Rally Championship and the FIA World Rally Championship.